The answer to the above question is yes there is and will be a legibility problem with the Auckland Plan 2050 when it comes to Nodes, the Centres and their place owing to the Unitary Plan. Is the problem fixable? It is and a pretty easy fix at that. The Return of the Super Metropolitan Centre? To support the Auckland Plan Development Strategy question around “How Auckland will grow and change – a quality compact approach” the Plan itself must be legible and line up with other documents such as the Unitary Plan (even if it means the Unitary Plan needs an interim update itself). The proposed hierarchy of: Node, City Centre, Metropolitan Centre within a Node, Metropolitan Centre, Town Centre etc makes the Auckland Plan illegible and confusing. If we look at Manukau we can see the node itself that encompasses a large area with the Metropolitan Centre in the middle of it. Given a Metropolitan Centre inside a Node will have different functions and characteristics to a standard Metropolitan Centre the new name needs to be brought in to differentiate the two Metro Centre groups. Cue the return of the Super Metropolitan Centre. The Super Metropolitan Centre was a concept I developed in the Unitary Plan debate of 2013-2016. In brief the Super Metro elevated Manukau and Albany into a new tier above the Metropolitan Centres but below the City Centre itself. The purpose being that the Super Metro recognised Manukau and Albany’s wider catchments and larger support roles than a standard Metro Centre seen elsewhere. As a consequence the Super Metropolitan Centre proposed zone allowed similar intensity of developments as the City Centre for when demand would warrant it. While the concept was never adopted as the Super Metropolitan Centre was not recognised in the Auckland Plan 2012 it seems the Auckland Plan 2050 is trying to usher the Super Metro Centre back in, in all but name – thus creating the illegibility problem in the proposed version of the Plan. That is the fundamental question the Development Strategy is trying to answer. Auckland will take a quality compact approach to growth and development. A compact Auckland means future development will be focused in existing and new urban areas within Auckland’s urban footprint, limiting expansion into the rural hinterland. delivery of necessary infrastructure is coordinated to support growth in the right place at the right time. Future development will be focused within Auckland’s urban footprint, with most of that growth occurring in existing urban areas. By 2050, most growth will have occurred within this urban footprint, limiting both expansion into the rural hinterland and rural land fragmentation. This approach contributes to investment certainty by understanding where and when growth is likely to occur. great social and cultural vitality – concentrating activity into urban centres and neighbourhoods provides a wider variety of activities to meet the full range of people’s needs. This brings diversity and vibrancy into the urban environment which in turn enhances interaction and social cohesion. aligning the timing of infrastructure provision with development. Again I notice the 60:40 Brownfield-Greenfield ratios have disappeared. The methodology of the Compact City is clearly set out (even with the missing Brownfield to Greenfield Ratio) and the Nodes (or Super Metropolitan Centres as it were) are doing the heavy lifting in making sure the Compact City goal is achieved. Linking the Nodes up with the rest of Auckland and outside of Auckland is outlined here: #AucklandPlan2050 – Transport: Linking Auckland In and Out. The Super Metropolitan Centre would be excellent in inserting a new tier that differentiates a Metropolitan Centre within a node and a standard Metropolitan Centre outside the Node. The City Centre would still hold its name and first spot ranking consistent with the Auckland and Unitary Plans but the three Metropolitan Centres (Manukau, Albany and Westgate) would be lifted from what would be come the third tier Metropolitan Centres and into the new second tier Super Metropolitan Centre. How would the Super Metropolitan Centre work? The Super Metropolitan Centre is the second highest in the centres hierarchy after the City Centre zone. While the City Centre zone recognises the pivotal role in Auckland’s present and future successes, the Super Metropolitan Centre can also play such a future pivotal role. More intensive than a Metropolitan Centre in development and catchment but less so than the City Centre Zone, the Super Metropolitan Centre will act as smaller scale complementary regional hub and international centre in: business, learning, innovation, industry, entertainment, retail and hospitality, culture and urban living. To improve the vibe of the Super Metropolitan Centre environment the zone permits a wide range of activities to establish in most parts of the SMC. The zone also manages activities that have the potential to adversely affect the amenity of the Super Metropolitan Centre. The Unitary Plan enables the second greatest level of development in terms of height and floor area to occur in the Super Metropolitan Centre (behind the City Centre zone). Within the Super Metropolitan Centre (Manukau and Albany) itself, development potential is concentrated in the core central business district. Development potential reduces towards the respective ridgelines (e.g. Redoubt Hill) and transitions to lower heights towards its surrounding flanks (e.g. bordering Papatoetoe, Manurewa/Browns Road, Wiri and Auckland International Airport. The Super Metropolitan Centre zone manages the scale of development in order to protect important sunlight admission to parks and public spaces, and significant views to the volcanic cones and other landmarks. The significant height and scale of buildings in SMC increases their visibility from many places, affecting the quality of both public and private views at local and citywide scales. In addition to managing the scale of development, the zone manages the quality of building design to ensure new buildings successfully integrate with the SMC’s existing built form and public realm to create an attractive and recognisable skyline. The Super Metropolitan Centre makes an important contribution to our sense of identity whether it is international, national, regional or sub-regional in sense identity construction. A Super Metropolitan Centre does have comparisons also with the lower order Metropolitan Centres in acting as hubs for a wide range of activities including commercial, leisure, high density residential, cultural, community and civic services – but also including tourism activities. 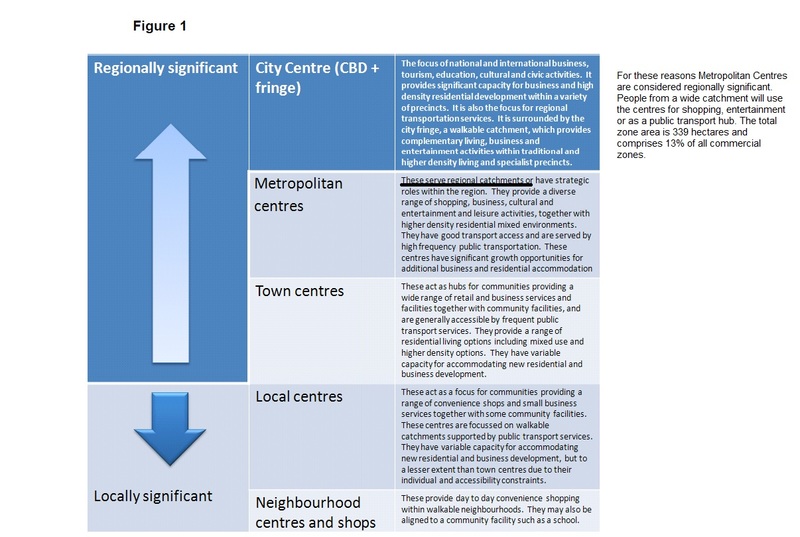 Super Metropolitan Centres development and activities are more intense level than an existing Metropolitan Centre but not as intense as a City Centre Zone as mentioned above. In further reinforcement to the urban-scape of the Super Metropolitan Centre while still recognising its higher order hierarchy, the SMC again must have some street frontages within the zone are subject to a Key Retail Frontage or General Commercial Frontage overlay. Key retail streets are the focal point of pedestrian activity within the centre. General commercial streets play a supporting role. Development fronting these streets is expected to reinforce this function. Rules for the overlay are incorporated in the zone rules. New development within the zone requires resource consent in order to ensure that it is designed to a high standard which enhances the quality of the centre’s public realm. This recognises that the Super Metropolitan Centre is a blend of the higher order City Centre zone owing to sense of identity and greater intensity of development, production and catchment; as well as the lower order Metropolitan Centre zone in the fact an SMC still will act as the “sub regional” (as well as wider regional) “place” as well. In saying that a Super Metropolitan Centre is viewed as a complementary City Centre area in-lieu of the existing City Centre Zone by some as part of their sense of identity attached to the SMC. The Super Metropolitan Centre is an attractive place to live, work and visit with a 24-hour vibrant and vital business, entertainment and retail areas. A hub of an integrated regional (and inter-regional)* transport system is located within the Super Metropolitan Centre and the Super Metropolitan Centre is accessible by a range of transport modes. learning, teaching and research activities, with a particular concentration in the learning precinct. Enable a significant and diverse residential population to establish within a range of living environments and housing sizes. Enable the significant concentration of office activity in Auckland (behind the City Centre Zone) to locate in the Super Metropolitan Centre by providing an environment attractive to office workers. Designs that positively contribute to the streetscape and character of their surroundings, having regard to the functional requirements of these activities. avoid large department stores and integrated retail developments locating outside the core retail area where they would adversely affect the amenity, vitality and viability of core retail areas within the Super Metropolitan City Centre and/or centres outside of the Super Metropolitan Centre. Support the development of public transport, pedestrian and cycle networks and the ability to change transport modes. Use framework plans to encourage comprehensive and integrated development of key development sites or precincts in the Super Metropolitan centre. Recognise the reverse sensitivity effects of the airport flight path can complicate (but not inhibit entirely) residential developments within the Manukau Super Metropolitan Centre. Enable the tallest buildings and the greatest density of development to occur in the core Super Metropolitan Centre district (subject to overlays such as the flight path). managing the scale and form of buildings to avoid adverse dominance and/or amenity effects on streets and public open space. Maximise light and outlook around buildings. Encourage public amenities to be provided within developments where possible, including publicly accessible open space, works of art and through-site links. Require building and development of the highest quality that contributes to the city centre’s role as an international centre for business, learning, innovation, entertainment, culture and urban living. Require building frontages along identified public open spaces and streets to be designed in a way that provides a sense of intimacy, character and enclosure at street level. Enable high quality and interconnected public open spaces that are accessible and provide spaces for recreational opportunities, facilities and events. iii. provide easily accessible pedestrian entrances. While the above was on how the Super Metropolitan Centre would be inserted into the Unitary Plan it is the full extension of high level summaries that would appear in the Auckland Plan 2050. That is in the Unitary Plan definition is how the Super Metropolitan Centre would be executed as part of the Nodes in the Auckland Plan 2050. Where a node fits into the Hierarchy of the Centres (City Centre, Metropolitan Centre, Town Centre etc)? The Super Metropolitan Centre removes Manukau, Albany and Westgate out of the standard Metropolitan Centre category into the new Super Metro category alongside the top-tier City Centre. How a node fits into the operative Unitary Plan (given all Centres are derived from the Auckland Plan 2012 (hence why I could not get the Super Metropolitan Centre inserted into the Unitary Plan as it was not in the Auckland Plan 2012)? The City Centre definition in the Unitary Plan would not change but the insertion of the Super Metropolitan Centre definition clarifies the language around the expectations of those Metropolitan Centres being elevated into Node status. What is the difference between a Metropolitan Centre within a Node and a standard Metropolitan Centre outside of a node? As explained in extensive detail above using the Unitary Plan Super Metropolitan Centre proposal definition. Does the City Centre now rank on par with Manukau, Albany and Westgate given all four are Nodes and are planned to handle some of the most intensive urban forms in urban Auckland? No. All four Centres are still categorised as Nodes under the Auckland Plan 2050 however, as mentioned earlier the creation of the Super Metropolitan Centre allows people to distinguish the difference between the City Centre, the three Super Metropolitan Centres (Manukau, Albany and Westgate) and a standard Metropolitan Centre like Takapuna, Henderson and Papakura. Let’s get the Super Metropolitan Centre inserted into the Auckland and Unitary Plans once and for all!